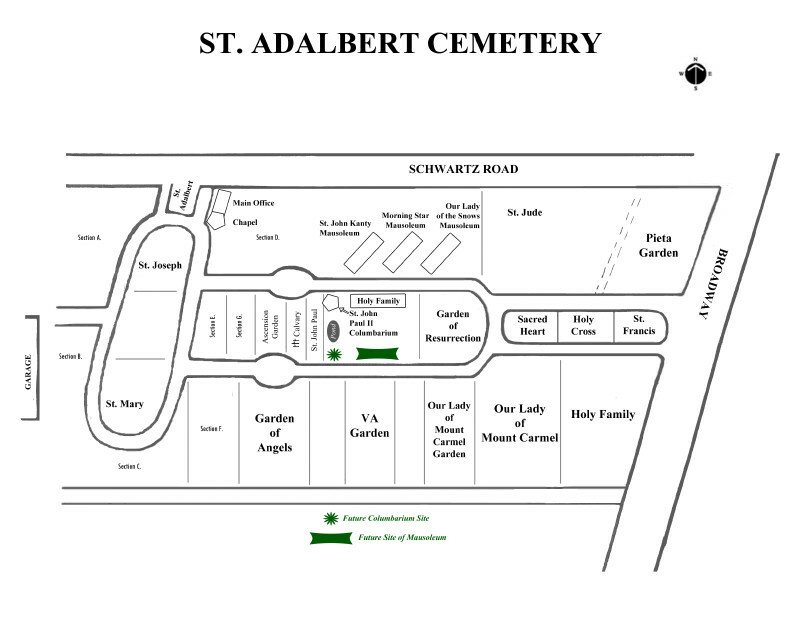 Catholic Cemeteries of the Diocese of Buffalo entered into an agreement with St. John Kanty Church to manage St. Adalbert's two cemeteries. (St. Adalbert Church is now the responsibility of St. John Kanty Church through canonical merger). The two cemeteries, one located on Dale Road in the Town of Cheektowaga and the other on Broadway in the Town of Lancaster, continue to operate and serve families as they have done so faithfully for many years. In response to increasing demand, St. John Kanty Garden Mausoleum was built in 2014, adding 368 crypt spaces and 376 niches for the placement of cremated remains. The mausoleum was dedicated at a special Mass on Saturday, June 28, 2014. An inspiring bronze statue of St. John Paul II looks out from the top of a new columbarium at St. Adalbert's Cemetery, as we honor one of the Catholic Churches' newest Saints. The columbarium has 80 niches that can house up to 160 sets of cremated remains and is the main feature of the new St. John Paul II Burial Garden which will eventually feature over 1,000 graves, with both monument and flush marker options. In addition, a much needed renovation of the office space was also completed. In 2018, the new St. Teresa of Calcutta Garden Mausoleum at St. Adalbert’s Cemetery was finished. Unique from the other mausoleum buildings at St. Adalbert’s, our new mausoleum boasts a higher profile than the other buildings at St. Adalbert’s. It is covered by a peaked roof that will be supported by four corner pillars with overhangs. This new roof design not only welcomes visitors with a “Church like feel” it also offers protection from the elements. A beautiful mosaic, one of the most captivating pieces of art in St. Adalbert’s, was installed on the west side of the mausoleum. It honors St. Teresa of Calcutta and is dedicated to her lifelong commitment to the poor and underprivileged. There is space available right behind the mosaic. In all, there will be 348 casket spaces and 240 niches for the placement of cremated remains.